NYC, 02/11/2019, 3:30PM. 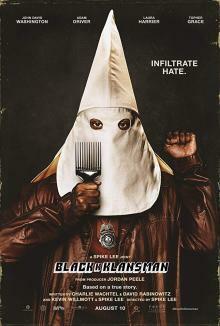 BlacKkKlansman (2018): Comedy crime by Spike Lee. 135 min. Starring John David Washington, Adam Driver, Laura Harrier. BlacKkKlansman premiered on May 14, 2018, at the Cannes Film Festival, where it won the Grand Prix. It was theatrically released in the United States on August 10, 2018, coinciding with the one-year anniversary of the white supremacist Unite the Right rally. The American Film Institute selected it as one of the top 10 films of the 2018 and at the 76th Golden Globe Awards, it earned four nominations, including Best Motion Picture – Drama. BlacKkKlansman grossed $48.3 million in the United States and Canada, and $39.9 million in other territories, for a total worldwide gross of $88.2 million, against a production budget of $15 million.